Hyderabad:(Page3 News Network)-In Andhra Pradesh, rescue operations are underway in full swing in north coastal region while about 150 villages are still under a sheet of water with heavy rains lashing several parts of the state for past five days. North Coastal districts and few other parts in South Coastal and Telangana regions are receiving heavy rain fall due to vigorous north-east monsoon and the influence of last week’s Nilam Cyclone. Rivers and rivulets are overflowing and several residential colonies and habitations nearby have been marooned. Road and Rail traffic has been thrown out of gear as flood water flowing over the rail road tracks and bridges at several places. Srikakulam, Visakhapatnam, East and West Godavari, Krishna and Guntur bore the brunt at maximum level. Nearly one lakh people have been shifted to relief camps after evacuating law laying areas in these districts with local authorities have set up about 90 relief camps. Meanwhile State Authorities have said 25 persons died due rain-related incidents. Hundreds of habitations and residential colonies have been marooned in the rain hit areas while Narsapurma in West Godavari district recorded highest rainfall of 31 in a single day. Standing crops in about 2.5 lakh hectares damaged and another 3 lakh hectares affected due to heavy rains. Two navy helicopters rescued about 70 persons from swollen Hemadrigadda rivulet in Visakhapatnam and about 60 persons who spent a day over their roof tops in Satyavarma in Srikakulam district. Meanwhile, reviewing the situation in Hyderabad, Chief Minister Kiran kumar Reddy has directed district authorities to make all out efforts for rescue operations. He asked them to speed up relief works. He will be touring in effected areas this afternoon.Meanwhile, Local authorities have declared holiday to schools in Srikakulam and West Godavari districts while scheduled examinations to MA, MSc and MBA students have been postponed in Visakhapatnam and Engineering semester exams have also been postponed in East Godavari district. Rescue operations are underway in the rain hit areas of north coastal Andhra Pradesh where flood water engulfed over 150 villages and towns. They remained cut off from the mainland for past several hours in Srikakulam, Visakhapatnam, East and West Godavari, Krishna, Guntur and Khammam districts which bore the brunt of heavy rains for the past five days. Rescue operations are on to save those people who are trapped in flood water while thousands of people are being evacuated to relief camps following inundation of several residential colonies and habitations in these districts. 25 people died and nearly a lakh people took shelter in relief camps set up in the rain-hit districts. Threat perception of flooding has gone up with met officials predicting more rainfall in the next two days. Passengers especially of long distance trains are facing severe inconvenience as a number of trains have been stopped at different places in the midway and cancellation of several other trains. Bus services too have been disrupted as roads and bridges are flooded. The Road traffic to Orissa from north coastal Andhra Pradesh has been shut down as a bridge at Palakonda has developed cracks. 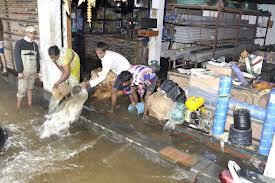 Over 70 villages in Visakha agency area have no electricity supply as four substations inundated. Schools in these affected districts remain closed. Narsapuram in West Godavari District has recorded 31 cms of rainfall, the highest in any single day. Two Navy helicopters rescued about 130 people from the swollen rivulets in Srikakulam and Visakhapatnam.